As one of the most dominant smart devices on the market, do we really know what, and who, we're welcoming into our homes when purchasing a secondhand Amazon Echo? 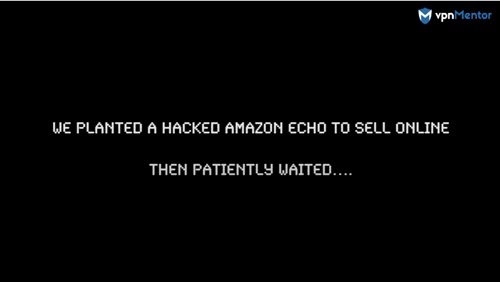 In this video, online security experts vpnMentor investigated the accessibility of Amazon Echo by hacking into one unsuspecting family’s device - highlighting how easily it could be tampered with. Amazon Echo - A wiretap waiting to happen? •	Always research a product, and any existing security threats to it, before you buy. •	Only buy your smart gadget from an officially certified source. •	Be aware of any signs of physical intervention with the product. •	Directly address the seller if you or someone else has identified any major misconfiguration. •	Make sure your smart device is properly configured and regularly updated. •	Keep your externally facing smart devices on a separate network. You can also watch their video investigation here to see how one unsuspecting family was affected after their devices were hacked. All devices mentioned were purchased and hacked by a team of ethical hackers in March-April 2018. Full details can be found in the whitepaper. Although all hacks took place in real-life, the scenes depicted in the video are a reconstruction of a scenario that would have been possible with the vulnerabilities uncovered.